Born in about 1289, Elizabeth De Burgh was the daughter of Richard, 2nd Earl of Ulster, one of the most powerful Irish nobles and a close friend and staunch supporter of King Edward I of England. That’s probably what saved her from the harsh punishments inflicted on the other members of the captured Bruce clan. 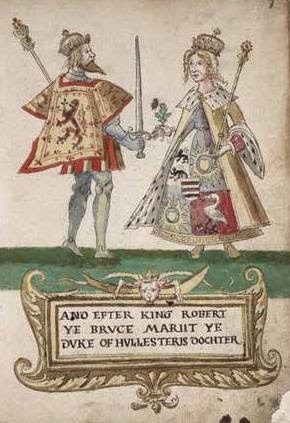 Elizabeth had married Robert The Bruce, the claimant to the Scottish throne in 1302. It’s not clear why. Maybe Edward, who treated Scotland as a vassal state, had arranged the marriage thinking it would guarantee Robert would be loyal to him. Or Robert, who constantly switched alliances during the Scottish Wars of Independence, thought it would be a wise political move. Whatever the case, Bruce kept his political machinations as well as his fight to regain the Scottish throne alive, and in 1306, he and Elizabeth were crowned King and Queen of Scotland. That didn’t really go down well with the English and, shortly after their coronation, Bruce was defeated in battle. In an attempt to protect his family, he sent his wife, his daughter Marjorie, who was born from a previous marriage, and his sisters Christina and Mary, escorted by his brother Niall and the Earl of Atholl, to Kildrummy Castle. They reached it safely, but the castle was besieged and they were forced to flee to the Orkney Islands. But they never made it there. On the way, they sought sanctuary at the small chapel of St. Duthac’s at Tain in Ross-shire, thinking that there, they would safe for a little while. But the Earl of Ross didn’t care for such niceties. He barged in, seized the women, and sent them to King Edward. Edward dealt pretty harshly with them. Christina and Marjorie, who was only12 at the time, were kept in solitary confinements in two different monasteries, while Mary was held in an iron and timber cage hanged outside Roxburgh Castle. Elizabeth, instead, was treated more leniently. She was moved from one residence to the other, including the Tower of London and Shaftesbury in Dorset, but was allowed to keep servants. Their imprisonment lasted 8 years. On June 24, 1314, Bruce finally defeated the English at the Battle of Bannockburn. Now, he was in a position to bargain and exchanged some English prisoners for his family. Elizabeth was now free to take her rightful place as Queen at her husband’s side. The couple had two daughters, Matilda and Margaret, and two sons, John, who died young, and David, who would become King David II of Scotland. Elizabeth died at the Cullen Castle in Banffshire on October 27, 1327.